The hydrogenotrophic methanogens Methanothermobacter marburgensis and Methanothermobacter thermautotrophicus can easily be mass cultured. They have therefore been used almost exclusively to study the biochemistry of methanogenesis from H2 and CO2, and the genomes of these two model organisms have been sequenced. The close relationship of the two organisms is reflected in their genomic architecture and coding potential. Within the 1,607 protein coding sequences (CDS) in common, we identified approximately 200 CDS required for the synthesis of the enzymes, coenzymes, and prosthetic groups involved in CO2 reduction to methane and in coupling this process with the phosphorylation of ADP. Approximately 20 additional genes, such as those for the biosynthesis of F430 and methanofuran and for the posttranslational modifications of the two methyl-coenzyme M reductases, remain to be identified. Copyright statement: Copyright © 2011 Anne-Kristin Kaster et al. 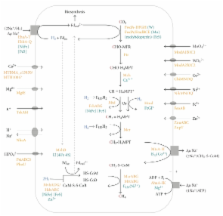 A genome-scale metabolic model of Methanococcus maripaludis S2 for CO2 capture and conversion to methane. A cysteine-rich CCG domain contains a novel [4Fe-4S] cluster binding motif as deduced from studies with subunit B of heterodisulfide reductase from Methanothermobacter marburgensis.